Optical astronomy; now this is the kind of astronomy a human being was born to do. In fact, until the last century, this was the only kind of astronomy anybody ever did. Now we’ve got the whole electromagnetic spectrum to explore, but our heart still belongs to optical astronomy. Of course, with bigger telescopes, better optics and more sensitive detectors, even optical astronomy has come a long way. Fraser Cain: You have some announcements; you’re going to be some places? Dr. Pamela Gay: I’m going to be at the Northeast Astronomy Forum this weekend and hopefully we’ll get this show posted before then. It is a great thing, not too far away from Newark or LaGuardia. It should be a good time for all and if you want to find out more, you can go to rocklandastronomy.com/neaf.htm or just Google NEAF. It should be a really good place. There will be folks there from Cambridge University Press, Sky and Telescope. Derrick Pitts who was recently on the Colbert Report is going to be there. We’re going to try and record a live question show of astronomycast. Later on in June I will be unfortunately not doing much astronomycast stuff. I will be at the American Astronomical Society meeting talking about IYA and about Galaxy Zoo. In July I’ll be at Convergentcon and I’ll be going on Eclipse of the Century. My husband is going to wonder if I still exist or not. Fraser: I can’t even keep it all straight. We’ll try and remind people as we get closer to various things and more meet ups. If you’re going to be at NEAF, bring your questions. Optical astronomy, now this is the kind of astronomy a human being was born to do. In fact until the last century this is the only kind of astronomy anybody ever did. Now we’ve got the whole electromagnetic spectrum to explore, but our heart still belongs to the optical. Of course with bigger telescopes, better optics and more sensitive detectors even optical astronomy has come a long way. As we’ve done with the other shows, let’s kind of set some boundaries here. Where does the optical begin and end? Pamela: We’re looking down on the red side. The longest wavelengths are around 750 nanometers. We’re talking about a hundredth the size of a human hair. Then it goes all the way down to about 380 nanometers, not quite a factor of 2 smaller. It is very, very short wavelengths which mean that when we start getting to build mirrors we have to get to the point that we’re polishing things down to the point that we can’t feel or touch the types of defects that we have to start worrying about. Fraser: Optical is just like what our eyes can see, right? Pamela: That’s the Plain Jane definition. What wavelengths of light can your eye detect? We define those as the optical wavelengths and the visible wavelengths. Fraser: Then let’s talk a bit about the equipment. I guess eyeballs, great big eyeballs. [Laughter] That’s what they all are, the Hubble eyeball telescope. No, so what are sort of the components of an optical detector? Pamela: Like with a lot of the other detectors we’re looking for something that is capable of bending light so that it can get focused down to a detector, get focused down to a point. Easy ways to do it with visible light that our eyes can see are either with glass or plastic lenses or with just any well-polished shiny surface. You can make an aluminum coated or a silver coated mirror, even take a piece of glass and coat the back of it with a sheet of aluminum and make an admittedly not high quality but nonetheless you can make a mirror capable of focusing light and capable of building a telescope. Fraser: Okay so we’ve got some kind of gadget that we’ll call a telescope [Laughter] for bending the light. Either with a lens which will bend the light and sort of focus it on a single point or with a mirror like a curved mirror which will bounce the light to a focus point. I’m missing a bunch of things but that’s kind of the gist of it. Fraser: That’s the first part, right is lens or some kind of focusing device to gather lots of light and put it into a single point. What else? Pamela: That’s basically it; once you focus the light you then need some way to record it. You can record it most simplistically by just looking and memorizing what you’re looking at. That’s not the most accurate way to record the sky. There are some amazing folks out there for instance the Reverend Bob Evans down in the southern hemisphere who have managed to memorize huge swaths of the sky. Fraser: That’s right he’s the guy who can find supernova, right? He can look and just kind of quickly look at this galaxy, that galaxy and find supernova. Pamela: He can go faster than a whole lot of different computers can in a certain way because he doesn’t have to take the time to reduce the data. He just looks at the field and there is no extra processing time required. Fraser: Right so this is [Laughter] human brain as detector, as a recording device. Let’s say that we don’t have that capability, that kind of memory so what are some of the normal ones? Pamela: In general you want to use some sort of either a digital or a chemical recording device. So the first way that we worked on recording the sky was using photographs where there are a lot of different chemical reactions that occur because you have visible wavelengths of light hitting a bunch of chemicals layered onto. With astronomy we normally layer them onto a piece of glass instead of a piece of film. Then you can process this and wherever light hit you end up with an image left behind. That was the first way that we worked on recording the sky. It was just plain old chemistry. That’s how our eye works as well is when the light hits the back of the eye it causes chemical reactions that trigger electrical signals to the brain. You can also just bypass the whole chemical reaction part and jump straight to how does light react at the atomic level. There are different devices that when the light goes through it can trigger one light causes electrons to build up within a detector and then you measure how many electrons build up in a given pixel. That corresponds to how much light hit the pixel in the detector. In reality you have to start dealing with what type of silicon chip is it that you’re hitting with light and it gets a lot more complicated. Bottom line, now you’re starting to look at how photons end up triggering reactions that cause electrons to build up. Fraser: The goal here with both photography and with the CCD is that you’re collecting photons, right? You’re leaving your instrument open and you’re just collecting photons for as long as you like. I guess our eyeballs work a little differently than that, right? We’re not like collecting photons for several hours. Pamela: No but there is a certain amount of persistence of vision. It’s not that if you get hit for only one gazillionth of a second that that gazillionth of a second is all your eye is ever capable of registering. Your eye actually can integrate how much light it receives over small periods of time and combine that light to have the chemical reactions go off at a level your brain responds to. We also have to worry about using up the chemicals in our eyes. Where you have persistence of vision in terms of you look at a really bright yellow thing on a piece of paper and then you look away and you see a different color against white. That’s because you used up so much of the yellow that your brain is going no yellow here. I’m going to show you where you should have been seeing the part of the white that comes from having yellow photons react with your eye. Instead you don’t see that at all and you end up seeing the opposite of yellow which is all the other colors that your eye is reacting to. Fraser: I guess the question then is and this is sort of one that probably a lot of people don’t really think about but when I see in the optical what am I seeing? Like I know I’m seeing photons doing 900 or 700 nanometers but what am I seeing? Pamela: This is one of the things that can get somewhat confusing. When you see an object what you’re seeing is either photons that are being emitted directly by that object or photons that are being reflected by that object. Fraser: Okay give me an example of emitted, it’s like the sun, right? Pamela: The sun emits light. Neon lights at bars emit light, that bright red open sign that you see. Fraser: My light bulb, right? Pamela: Yeah all these different things are emitting light. Pamela: The TV, the one that we, the computer monitor. That’s what I experience the most. Fraser: Photons are being emitted. Pamela: Yes and these photons then travel around and they bounce off of things. So I’m able to see my iPhone which is sitting face down on the desk because the shiny silvery part is reflecting back at me a whole different range of colors of light. I’m currently wearing a blue polar fleece because it is disturbingly cold for April. The reason it appears blue is because the fuzzy soft comfyness of it absorbs some colors and reflects other colors. The set of different colors of photons that it is able to reflect add up according to my eyeball to light blue. When I see black that’s because something isn’t reflecting light at all. Fraser: How do the colors then correspond to the objects that are doing the emitting? Why is our sun sort of a yellowy white color while you’ve got red stars and blue stars? Pamela: The color that an object glows can depend on two different things. One is like you said its temperature. We have blackbody emitters. When you see Captain Kirk in some of the old original episodes of Star Trek heating up rocks with his phaser, those rocks glow red because they’ve been heated up to 1,000 degrees or so. With blackbody light you have a whole distribution of different colors of light that are being given off. Some of them are going to be blue. Some of them are going to be infrared beyond what we’re able to see. We’re going to have this characteristic curve in distribution that the largest number of photons is given off at a specific color that depends only on the temperature of the object. If I want to shift the color that the most photons are given off at all I have to do is either heat up or cool off an object. Because all these different photons are being given off and because our eyes are able to detect color because they add up all these different photons, they see purple because they are perceiving red and blue. We cumulatively take all sorts of different photons and mix them in our chemical reactions in our eyes to perceive myriads of different colors. What’s neat is one of the reason we don’t see green stars is because there are so many different colors of light being given off and the chemical sensitivities of our eyes combine to make it that we see what should be green as instead white. It’s just the mixing of the photons. Fraser: When we see some object like I guess when Kirk takes his phaser and heats up that rock and it gets to the point that it is going red or even white it is not giving off white photons. It is giving off a spectrum of photons that add up in our eyes as white. But if he keeps on heating it up and it turns say blue then it is giving off enough blue photons that it kind of overwhelms the other photons and so we see it as blue. The same with red, right? Pamela: You can get a sense of how this works if you get really, really close to an old cathode ray television, one of the big fat hard to move ones that I still own that are still getting replaced by LCD and plasma screens. If you get really close to one of these you’ll be able to see that it is made up on the screen of just blue red and green pixels. The mixture of color that you’re able to perceive is just a mixture of how much of the light is given off in the red, how much is given off in the blue, but your television in reality only has three colors. It is just able by mixing the intensity of these three colors to trick you into perceiving millions of colors. Fraser: Just to summarize here, you’ve got like some object, let’s call it the sun. It is giving off photons in the radio and giving off photons in the x-ray. But it is also giving off photons in what we can detect across that spectrum from red to blue with all of the colors in-between. Other of the photons are hitting around us and then all the color except for the color that we see are getting absorbed to a certain extent to change the mixture of the photons that are coming towards our eyes. So your cozy blue sweater is absorbing all the other colors in such a way that the blue photons are coming out of it in such a way that that’s what you see. Pamela: Red photons hitting it don’t have a chance. All the red photons get absorbed. Fraser: Right, the red photons are getting absorbed while the blue photons are getting reflected; maybe even some of the green to get that really nice mix to get that aqua color or whatever. You’re getting that mix of photons. You’re saying the red photons are just getting completely absorbed. Pamela: And that’s okay, maybe they’ll help warm me up a little bit. Fraser: But in another situation I’ve got a red cup so in this case it is the red photons that are bouncing off of it and the green ones and the blue ones are getting absorbed. Pamela: What’s kind of neat is if you go into a room and replace all the light bulbs with say a red light bulb; say it is a red neon bulb actually. It is only emitting light in the specific wavelength that comes off when you excite neon. This is the cool thing about fluorescent bulbs and neon bulbs is they give off light not in this whole range of colors that you get from the sun, that you get from incandescent bulbs or that you get from Captain Kirk’s warm rock. With neon bar signs and store signs and with fluorescent bulbs the light that you see is caused by an atom getting excited such that its electrons go to an excited level and then they drop down and in the process they give off light in a specific color. One of the things that is cool about visible light is it is where a lot of the really neat and interesting atomic lines happen. If you want to go study all sorts of things like formaldehyde go look in the radio, in the submillimeter, go look in the infrared, all the really cool molecules are cold. They fall apart when you heat them up. If you want to see the cool atomic transitions excite helium gas, excite neon gas and you get to see it in optical light. If you light up a room with a red neon sign you’re never going to see green or blue. All of those objects are going to appear black because they can’t reflect the red light which is your only source of light. That’s just kind of neat. Fraser: You’re just going to see shades of red or nothing at all. Fraser: Let’s bring it around I guess and talk about actually astronomy here. [Laughter] We kind of know that the objects that we’re seeing here giving off these photons, so then what kinds of objects are we seeing with our optical instruments? Pamela: One of the really convenient things is we’re able to start seeing the hydrogen bomber lights. We can see the different transitions that electrons go through when they’re in their second energy level in the hydrogen atom. This is important because our star – the sun – is mostly hydrogen. If you look at it through an H-alpha filter, this is for electrons that are going between the third and second energy level in the hydrogen atom, when you see these transitions we can study all sorts of different neat fine grade features in the sun. We can start looking at the corona. We can start looking at the granulations on the surface because this transition is very sensitive to differences in temperature. You’re able to see here where you have this temperature you have lots of light. Here where you have a lower temperature, this transition isn’t occurring as frequency so you have less light. We’re able to study the sun in very fine detail just by looking at the light that comes from this particular atomic transition in hydrogen. Fraser: I’m thinking when I look at a really cool nebula, a Hubble image that is in optical that’s a really cool nebula, what am I seeing there? I see these pretty colors. In many cases I know it is artificial, right? In some cases you’re actually seeing a real representation of what you would see with your eyes, right? Pamela: Green in planetary nebula comes from oxygen emission. There are certain colors that are tied to certain elements. We see these amazing reds when you have something that is hydrogen. With different H-alpha lines you have these amazing greens that are associated with an oxygen-3 line. Different atoms give off specific colors and a lot of times when we see these big red nebulas they are hydrogen-rich nebulas. Fraser: Does that mean that that part of the nebula is at a certain temperature? Pamela: It depends on if what you’re seeing is an emission line nebula. When we see the planetary nebula the green in planetary nebula that is where you have excited oxygen. That particular oxygen is excited to that temperature. It is kind of hard to say the whole nebula is excited to a given temperature. What you’re actually talking about is with the given rate of collisions and the incident light, what is the probability you’re going to end up having given transitions take place. Temperature starts to get fuzzy when you don’t have a lot of collisions going on. Fraser: That’s essentially what the optical light temperature is that you’re getting these transitions and the photons are getting ejected out? Pamela: All because the oxygen molecules are acting at a certain temperature doesn’t mean that if you go stand in the middle of the nebula you’re going to feel as though that’s the temperature you’re at. That’s where it starts to get complicated. What does temperature mean? It starts to get philosophical at a certain point or quantum mechanics choose if you want to do the math or the philosophy. Fraser: If we’re looking at stars we’re definitely seeing an indication of temperature. Pamela: Yes. With stars what we’re seeing is the blackbody emissions. When we look at the red dwarfs what we’re seeing is cool stars. When we start to look at the O stars in the Orion nebula that appear white and blue this is where we’re looking at exceedingly hot stars. When we look at planetary nebula and we see the different colors in the nebula what we’re seeing is generally specific elements that are giving off light due to specific electron transitions. Fraser: I guess the last part of this is to talk about the instruments out there that are observing in the optical light. Everybody’s amateur telescope? Fraser: I’m sure there are a few out there who have big radio dishes but most people are observing in the visible light, all the big observatories and the medium size observatories with their big telescopes? Pamela: This is where I think we also have to think about the greatest problem with observing in optical light and that is our atmosphere. Pamela: When we look at things in the radio, the light as it comes through our atmosphere isn’t affected that much by the atmosphere. You have to worry about the atmosphere absorbing your light but you don’t have to worry that much about the atmosphere on focusing your light. With optical, as the light passes through hot and cold pockets in the atmosphere that hot and cold act just like lenses. It changes the path of the light. As the light makes it all the way through the atmosphere it is going to make its way through all sorts of different pockets at all sorts of different temperatures that are moving. So one photon and its neighboring photon might have very different pads just because they happen to hit different pockets of air as they went. This muddies our images. It’s called “seeing”. You can actually see this when the jet stream is straight overhead. All the stars are twinkling wildly as they go through the turbulent atmosphere. Here on the planet Earth as we try and capture the light we have two goals. The first is catching as much light as possible. This is where we build huge telescopes and focus all of the photons from this huge telescope’s mirror down to one little tiny detector that’s measured often millimeters across. This allows us to see faint objects at the very edge of the universe. Being able to capture light from faint objects at the edge of the universe while highly satisfying, is even more satisfying when you can get it sharply in focus. This is where we’ve started building technologies that allow us to in some ways correct for what the atmosphere does. We have adoptive optics where either a bright star is observed with extremely high speed imaging and a mirror can actually get flexed to compensate for what trouble the starlight is experiencing, to try and to best approximation remove the atmosphere’s affects that make the star no longer look perfectly circular. Fraser: We have a whole show on adaptive optics and interferometry. Pamela: Both of these are ways of bringing things into focus that otherwise might be blurred out. The ultimate solution of course is going to space. 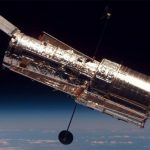 This is where the Hubble space telescope has done such an amazing and unparalled job given its size and age and the technology attached to it. I think any amateur astronomer out there who has been using the same telescope every single night since the 90s would be out ready to buy a new one by now. We just keep going and the Hubble just keeps going and we’re getting ready to repair it one more time. Fraser: The trick with Hubble is that it is above the Earth’s atmosphere. You don’t get those tiny permutations and so the photons all make a perfectly straight path from whatever emitted it right into the mirror of Hubble. Pamela: We’ve so far been able to for the past almost 20 years, it is scary to think about been able to go out and keep observing and get rid of the atmosphere a telescope roughly the size of a school bus. Only now with the Very Large Telescope are we able from the ground to start achieving the sharpness of focus that the Hubble space telescope is able to get every day. Fraser: I think I did an article a couple of years ago about Dome C which is a spot on Antarctica. Cold air is really good for good seeing and high altitude is good for seeing. You put those two together and you get this spot at several thousand meters above sea level in the coldest spot on Earth and the plans are to build a fully robotic telescope there. It would not be quite as good as being in space but would definitely be like the best spot on Earth to view the Heavens. If we can’t launch more space telescopes maybe there will be more telescopes bunched up around the South Pole. Pamela: For now we wait for the newest and best things to get built. As far as optical astronomy goes the plans that they have are truly overwhelming. Fraser: Yeah, and we did an episode on that about all the monster telescopes coming down. There is no great big optical space telescope planned to replace Hubble. Pamela: No and it is really going to be interesting to see once James Webb gets launched where does the focus on the next big thing that we decide get pointed. I don’t know I’m hoping that we get another multi-wavelength workhorse telescope up there but I’m just one astronomer. Fraser: It seems weird to me that there are no plans to have another telescope that can do the same kind of thing that Hubble can. Does this just mean that optical is not as important anymore? Pamela: I think it is actually a change in the fields. There have been a series of debates. Simon White and oh, cold I can’t remember his first name, they’ve been related to dark energy arguing over do we invest our dollars in projects like WMAP that answer one question really well. Or, do we invest our resources in projects that like Hubble are able to answer questions that we can’t even imagine when we launched the spacecraft? So we had WMAP, you and I keep hoping that terrestrial planet finder is going to up. Darwin and Herschel and Planck are coming in the future which are fairly much single-purpose systems. They’ll do other things but that’s their justification. It could be that as we move into the future we may just be changing how we think about designing these systems. Fraser: It may be that the big ground-based telescopes do the trick. Even though they’re going to be 30 meters across they’re still going to be built at a fraction of the price of a space telescope. It might just be that the economics will work out. Even though you don’t get quite as clear a view from the ground it is still cheaper to make a ridiculously big telescope than to try and launch a space telescope. Pamela: Also to be able to experiment with: “hey I’d like to try turning this screw in this direction.” You can’t run that sort of random experiment to see if you can make things that much better when you’re dealing with something that is out beyond the moon which is where they’re planning to put the James Webb space telescope. Fraser: For the foreseeable future, all of the best visible optical astronomy is going to be done from right here on the ground when Hubble goes. Fraser: Right, which is both amazing and kind of sad all at once? Alright Pamela, thank you very much for your optical viewpoint and next week I guess we’ll have to the ultraviolet. If there is a ballot , I vote for Chris Lintotte too. I don’t think Pamela’s going to miss recording Astronomy Cast. We can always record them in advance. But we can have more episodes with Chris Lintott too if you like.